In the final video presentation dedicated to the Super Smash Bros. for Nintendo 3DS and Wii U games, creator Masahiro Sakurai provided many details about previously announced character Cloud from FINAL FANTASY VII, as well as introduced two new playable fighters to the franchise: Corrin from upcoming Nintendo 3DS game Fire Emblem Fates, and Bayonetta from the critically acclaimed Bayonetta games. 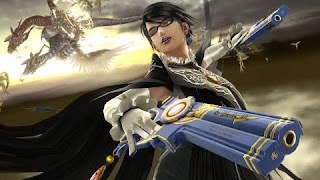 Bayonetta was the overall top pick in the recent Fighter Ballot, which asked fans to nominate characters that they would love to see added to the Super Smash Bros. series. Bayonetta was the No. 1 pick in Europe and in the top five in North America. When factoring in the amount of votes, Bayonetta was the clear worldwide choice. In addition to detailed information about the new characters, Sakurai also revealed two new stages coming to both Super Smash Bros. for Nintendo 3DS and Wii Uas downloadable content. Midgar – a familiar location for fans ofFINAL FANTASY VII – will join the series as Cloud’s stage, while Bayonetta will feel right at home in the Umbra Clock Tower stage. New Mii Fighter outfits will also be added to the game, highlighted by a full costume inspired by Geno from the Super Mario RPG: Legend of the Seven Stars game for the Super Nintendo Entertainment System. All of these new additions will be the last downloadable content forSuper Smash Bros. for Nintendo 3DS and Wii U. This new content brings the total number of playable characters to 58, the total number of stages in both versions of the game to 84 and the number of costumes and hats to 99 and 97, respectively. As revealed in the Nintendo Direct presentation last month, Cloud from FINAL FANTASY VII is coming to Super Smash Bros. for Nintendo 3DS and Wii U. The character will have two costumes: one inspired by the original FINAL FANTASY VIIgame and one from FINAL FANTASY VII: Advent Children. Like in FINAL FANTASY VII, Cloud possesses Limit Breaks when fighting in Super Smash Bros. As Cloud gives and receives damage, or uses his Down Special Attack, his Limit Break meter will fill. Once full, Cloud can activate his Limit Break. While playing on Midgar, Cloud’s new stage, players can grab Summon Materia that call forth summons from the FINAL FANTASY universe like Ifrit and Bahamut ZERO. Once activated, only the player who triggered the summon will be safe from damage. Cloud and the Midgar stage will be available as a download in Super Smash Bros. for Nintendo 3DS or Wii U for $5.99, or both game versions together for $6.99, beginning within hours of today’s video presentation. The Umbra Witch herself is joining the giant cast of playable characters in Super Smash Bros. for Nintendo 3DS and Wii Uas a result of the worldwide Fighter Ballot. Just like in her action games, Bayonetta is a combo fighter in Super Smash Bros., chaining different kinds of attacks together. Her signature move is Witch Time, which slows down opponents if they are within range. Her new exclusive stage is called Umbra Clock Tower and is filled with moving platforms and even an alternate world. Bayonetta and the Umbra Clock Tower stage are planned for launch in February 2016, both available for download in Super Smash Bros. for Nintendo 3DS or Wii U for $5.99, or both game versions together for $6.99. For more information about Super Smash Bros., visit http://www.smashbros.com/us/.